Gift Vouchers Cooking Classes, for Wood Fired Cooking & Pizza Tools are Available Now. 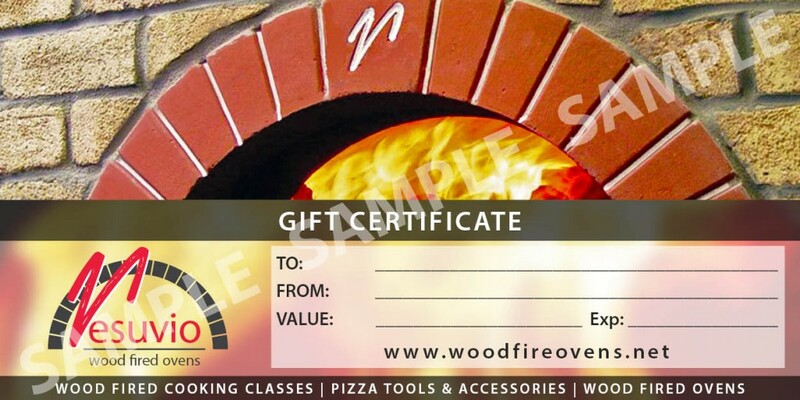 Vesuvio wood fired ovens now offer GIFT VOUCHERS of any value that are redeemable for wood fired ovens, wood fired cooking classes, pizza tools and cooking accessories. CONTACT US now to purchase a gift certificate of any value! We currently offer two types of cooking classes in the Vesuvio Wood Fired Kitchen, hosted by resident chef Joe Cassisi, an internationally accredited chef with many years of experience with wood fired cooking. Vesuvio pizza cooking classes include how to build the perfect fire, secrets of making the perfect pizza dough including hand stretching like a pro and tips on finding the most authentic ingredients. You’ll be making pizzas so well that your friends and family will be inviting themselves over for your famous creations! Vesuvio meat and seafood cooking classes will inspire you to expand your wood fire cooking to include so much more than just pizzas. Learn preparation techniques as well as how to expertly cook an array of meats including poultry, seafood and roast meats. You’ll even learn how to prepare and bake the perfect roast vegetables to complete your meal. Vesuvio classes are intimate with class sizes limited to ten people to guarantee personalised attention, plenty of hands-on experience and generous food tasting accompanied with fine Italian wine. Specialising in premium-quality, exquisitely crafted Tuscan-style wood fired ovens, Vesuvio Wood Fired Ovens offers the largest range of residential wood fired ovens in Australia. With several different models and various sizes to choose from, we are certain to have an oven to suit your budget, lifestyle and setting. The BABY series is the newest addition to the Vesuvio oven range. Made by Valoriani, a well-established Tuscan-based family business, the Baby utilises their 50 years of experience to create a professional quality oven in a size that is ideal for domestic use. This stylish and practical garden oven comes complete and finished, with or without the stand, so you can start creating your culinary masterpieces straight away! Other wood fired ovens from the Vesuvio range include the FVR series and the TOP series kit ovens that are perfect for completing any outdoor kitchen. They can be built onto a base of your choosing and finished to suit your alfresco area. With a range of sizes there is bound to be a Vesuvio oven to suit your design and entertaining needs. Vesuvio are distributors of high quality, durable pizza tools from Italian manufacturer, GI Metal. From aluminium or stainless steel pizza peels to oven brushes, pizza screens and bamboo pizza boards – if you need it to create the perfect pizza then Vesuvio stock it. There is even a great starter kit with everything you need to get started at home, including a convenient wall mount! So buying a gift for that hard-to-please, passionate food lover no longer needs to be so difficult. Purchasing a Vesuvio Gift Certificate means allowing them to explore the culinary world of wood fired cooking and added bonus – the whole family get to benefit from the tasty creations that ensue!